Tea Pea Cafe in Borivali is the perfect place to lounge at with your friends, play some board games or just grab a book and pick a corner here to read it at. 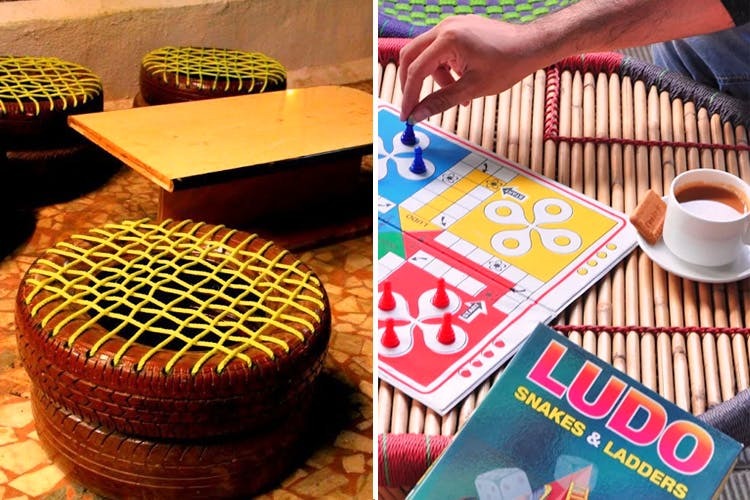 Tea Pea Cafe in Borivali has two outlets, and this one is all about beautiful, quirky interiors and fun board games. The ambiance boasts of eclectic seating arrangements such as tyre seats, bean bags, cane furniture, school benches, etc. The cafe will make you revisit your childhood with plenty of board games like snakes & ladders, ludo, scrabble, jenga blocks, hand video game, chess, UNO etc. Mildly lit and located in a corner in a tower, this cafe is perfect for tea-lovers as a large part of the menu is dedicated to a variety of teas. They also have healthy sandwiches and other nibbles to munch on. Chai-lovers, make your way to Borivali and park yourself in this adorable cafe.